RoboPorter, a friendly mobile robot, will carry your bags. RoboPorter uses a front-mounted camera to see where it is going; it also has an ultrasonic sensor to make sure that no people are standing in the way, and it is safe to move. RoboPorter is about four feet tall and is able to carry about forty pounds of baggage. Tests on usability are currently being conducted in Kitakyushu Airport. 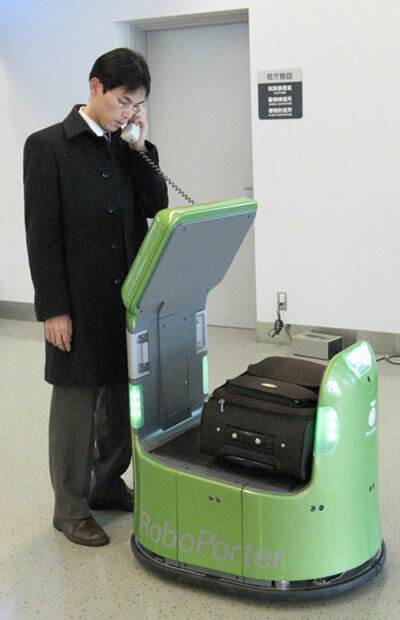 To use RoboPorter, you must stand respectfully in front of it and state your destination (in Japanese). For example, you might tell RoboPorter that you want to go to the taxi stand. 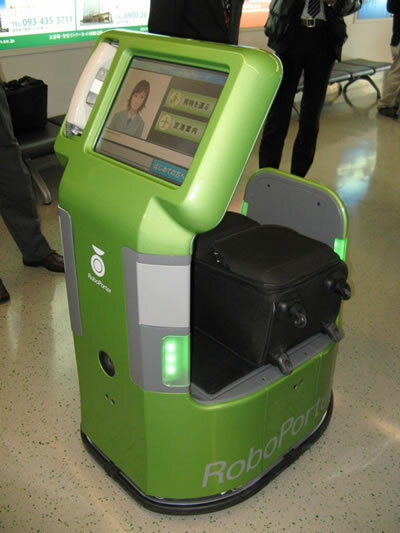 Once you have been guided to the taxi stand, RoboPorter stands by patiently as you take your bags. Then, it's mission completed, RoboPorter heads back inside the terminal to find someone else to help. This shopping assistant robot will fetch your belongings along. This item reminded many readers of Luggage from Color of Magic by Terry Pratchett.